Curry leaves are a great source of proteins and beta-carotene. Proteins that prevent from hair thinning and beta-carotene that helps in prevention of hair loss. Curry leaves are also rich in amino acids which are helping in the prevention of hair loss and strengthening of the hair follicles. Curry leaves contain antioxidants that moisturize the scalp and help in removing dead hair follicles. Curry leaves contain vitamin B6 or pyridoxine which helps in stabilizing hormone levels. By doing that, it actually strengthens hair shafts and roots. All you need is a handful of fresh curry leaves and 1 small bowl of coconut oil. Add the curry leaves in the bowl with coconut oil and boil the mixture until you notice a black residue forming. After the mixture has cooled down, apply it on your hair and scalp and let it on for 1 hour. After that just wash it off with shampoo. Boiling the mixture will help the nutrients in curry leaves to infuse with the oil to form wonderful hair tonic. Do this twice a week for a month and you will notice a big change in the hair texture. Curry leaves contain nutrients that essential in restoring the dead skin on the scalp, and also allowing the hair follicles to breathe. They prevent the hair from turning gray and strengthen the roots. You only need a handful of curry leaves and yogurt. Start by grinding the curry leaves in order to make a thick paste. Then mix one tablespoon of the paste with four tablespoons of yogurt. Whip them until smooth batter forms. Massage your scalp and hair with this hair mask and let it on for 30 minutes. After that just wash it shampoo. Repeat this once a week to get long, smooth and shiny hair. 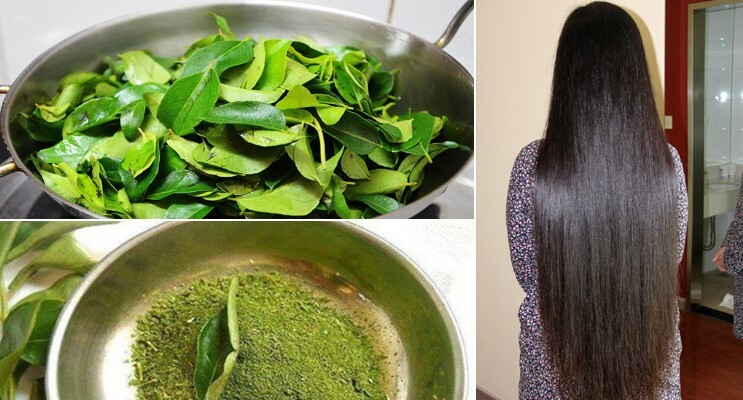 Implementing curry leaves into your diet can be of great help with your hair-related issues. There are many ways to add curry leaves to your diet such as: adding curry leaves powder in rice and curries, consuming ground curry leaves with milk or buttermilk and many more. Curry leaves offer natural and economic solutions to several hair-related issues. Try them and obtain healthy vigor and beautiful, shiny locks.Try any of the above and let us know which worked for you.